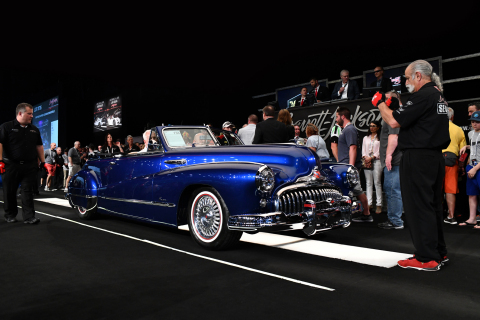 PALM BEACH, Fla.--(BUSINESS WIRE)--Barrett-Jackson, The World’s Greatest Collector Car Auctions, was once again the hub of the collector car hobby during the 17th Annual Palm Beach Auction, April 11-13, 2019. In total, 632 vehicles sold for over $30.18 million with a 98.9 percent sell-through-rate, while 258 pieces of automobilia brought in nearly $500,000, and $550,000 was raised through the sale of three charity vehicles, bringing the total auction sales to more than $31.2 million. This marks the company’s largest 3-day Palm Beach Auction to date with a record number of collector vehicles, nearly 1,500 bidders and strong attendance. Results show that Resto-Mods continue to be in high demand while supercars command record hammer prices. Barrett-Jackson’s Automobilia Auction featured over 258 authentic pieces, including the final segment of the William K. Haines Collection. Authentic vintage gas pumps were among the top sellers, led by a 1950’s Dog N Suds Animated Neon Porcelain Drive-In Sign (Lot #5998) that sold for $19,550, which was also the top-selling automobilia piece in Palm Beach. Click here to learn more about the 2019 Northeast Auction docket. For more information on becoming a bidder or to consign a vehicle for the 2019 Northeast Auction, visit www.Barrett-Jackson.com. Barrett-Jackson was once again the hub of the collector car hobby during the 17th Annual Palm Beach Auction.